These one-page "how to" sheets provide practical information and drawings to assist the builder. These sheets should be used only as guides and are not intended for use as construction drawings. These tech sheets are offered free of charge. Please limit your selection to one copy of each title per customer. 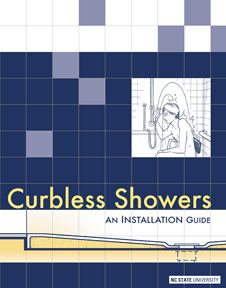 This booklet introduces the curbless shower and shows how the size and other details can be incorporated to successfully control water. It can help architects, builders, remodelers, installers and carpenters better understand the critical design and construction issues involved when installing curbless or "roll-in" showers. This booklet was designed to help individuals avoid costly - and sometimes dangerous - mistakes in the design and construction of ramps. In simple language, it touches on entrance options, design and materials choices, costs, and compliance with codes.